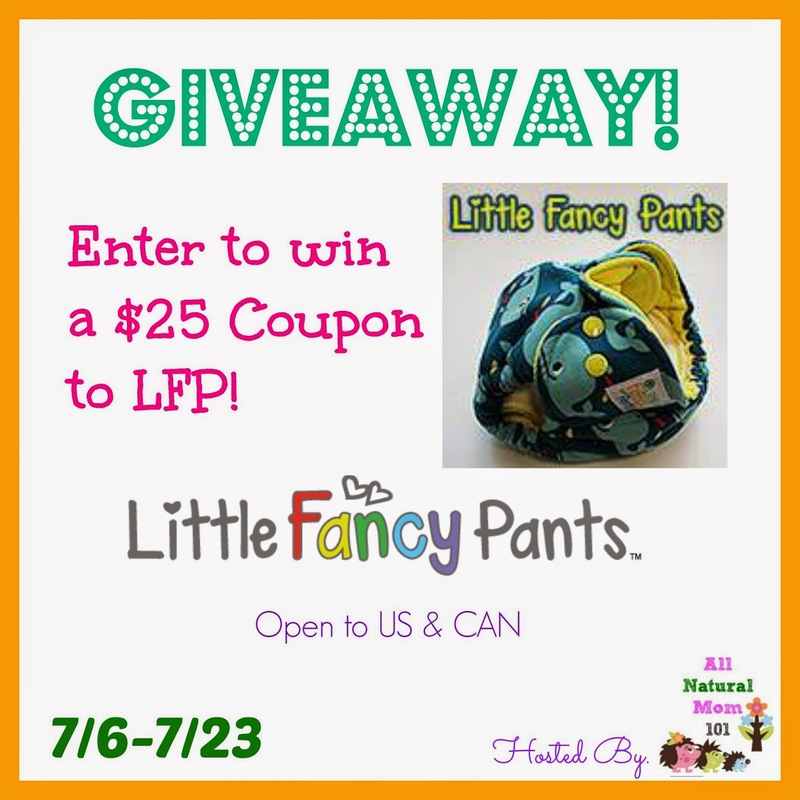 AllNaturalMom: Little Fancy Pants Giveaway! Welcome to the Prefolds to Potty Training Event and Blog Hop, hosted by lo-wren.com and Change-Diapers.com! This event began as a one year cloth diapering anniversary celebration for Lauren last year, but has grown into a celebration of the journey from diapering through potty training. Join us for two-and-a-half weeks of cloth diapering and potty training guest posts, introductions to some amazing products (to help get you through the diaper-potty training journey), two amazing grand prize packages, and a blog hop with fifteen other bloggers giving away cloth diaper and potty training prizes! sure to check out (and thank) our amazing grand prize sponsors, and "hop" on over to the other participating blogs via the linky at the bottom of this post. Enter for a chance to win $25 to Little Fancy Pants! I'd probably stock up on those adorable wipes! Since I'm going to be cloth diapering my new little nugget when he/she gets here (about 7 weeks to go!) I might as well go all out and use cloth wipes as well! I plan on getting some eco-friendly cloth wipes. I would love a new diaper cover... these are adorable! I'd definitely get a cloth diaper. The prints are adorable! Definitely a diaper! would by a cloth diaper!!! Wipes would be a nice luxury! I would love a new cloth diaper! I would get a new cloth diaper. Such cute prints. Love LFP diapers! Would definitely get a diaper. Diaper!!! I still need more to reach my every other day laundry goal! Secretly I'm glad I'm still stash building! #buyallthediapers! #winallthediapers! I would like some inserts,. I would buy one of their cute cloth diapers! I would get some cute 3/4T undies for my daughter! I plan on buying diapers. There are always so many cute things at LFP to choose from, I'm not sure I know what I'd pick yet if I won. I'm addicted to fluff so I would probably get another cloth diaper! I think I'd get a pair of the fancy pants. I could really use new wipes but I know I'd go for a diaper - so much more fun to buy! I would either get some doublers or some undies. Either a diaper or a pair of Fancy Pants! Well, I would love one of their pink shipwrecked Mickey diapers if they come back in stock! That exact whale diaper in the picture! I love whales! I would probably get a diaper and buy some wipes! I would definitely buy a diaper! I love the rainbow milk diaper! I would buy a diaper! I like the Oz at Dusk. I would buy the diapers. NB cloth diapers or cloth pads. Need diapers for my upcoming little one!! I would buy cloth diapers. I'd get some of the bamboo doublers! I would buy wipes to donate! I would love to use it for some undies for my toddler, I am really hoping they would help her potty train! I would buy cloth diapers! Definitely diapers!!! This would be great!! We're still fairly new to the cloth diapering world, so we would buy more diapers to build up our stash! Heard these cloth diapers are amazing - a cloth diaper for sure!! I would buy a newborn diaper with it! Thanks for the chance to win! Probably, a cloth diaper, since I am wanting to try them. I could use some more cloth diapers and inserts so I would love to spend the money on one of those things! I plan on using my gift card to purchase cloth diapers. I would use it for clothe diapers, which I need soon. I'd probably buy a diaper... Love the Oz at Dust print! I would get cloth diapers. I would either get a CD for my little one, Or a set of undies for my toddler that is currently being potty trained. I would get a set of undies for my little one! I'd probably get a few soakers or undies. I plan on buying cloth diapers and inserts with it! ...some inserts would be a big help. I'd put it towards a diaper, like the Magic Dragon hybrid fitted. Not sure, either wipes or inserts. I'm not sure but I love the Love Bums "Fancy Pants" - Lime Crankies ! too cute! I have blue cranky cloud diaper! I would get a diaper in the Jack print! Definitely a diaper. I live the giraffe print most of the ones up now! I would get a cloth diaper. I would get the Dark Side Hybrid Fitted diaper! I would most definitely get diapers! I would get a diaper. I would love to get some new wipes! I love the bugs bunny fitted and would get that if/when it comes back in stock!